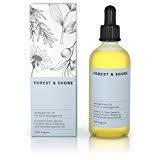 So I recently tried Forest and Shore's new beauty elixir oil for hair, the Halleluja Hair Oil. It's 100% organic, cruelty-free and packed full of botanicals, which promises to nurture and restore weary tresses. What I particularly liked about it was that it’s an oil, so it’s super hydrating, but it doesn't weigh the hair down like other oils do. It was moisturising without feeling that you had an oil slick on your head.